Castro and Barney Need Our Votes! No team in the major leagues can claim to have a more exciting, talented dynamic duo up the middle than the Chicago Cubs. Starlin Castro and Darwin Barney have proven to be strong building blocks for the franchise going forward and a solid foundation for the team to lean on this season. They both deserve All-Star recognition and you can help send them to the starting line-up by voting for them over and over again. I received the following email a few minutes ago…feel free to use the link below to vote for Starlin Castro, Darwin Barney (write-in) and your other favorite Cubs players you feel should represent the National League and the Chicago Cubs in this year’s All-Star game! The National League All-Star ballot update was released today and top Cubs performers Starlin Castro, Darwin Barney and Alfonso Soriano need your help to make the squad! Starlin Castro ranks second among MLB shortstops in hits and average entering today’s games, while write-in candidate Darwin Barney leads all MLB rookies in hits, runs and batting average. Alfonso Soriano — currently ninth among NL outfielders in All-Star voting — is tied for second in the NL with 12 home runs. Fans can cast their votes for starters up to 25 times on cubs.com — online or via your mobile device — using the 2011 All-Star Game MLB.com Ballot Sponsored by Sprint until June 30 at 10:59 p.m. CT.
AND… while you’re at it, vote for my son Rhys (shameless plug) in a contest! You can help put him on the cover of an upcoming issue of Parents Magazine. Now wouldn’t that just make your day? Ok, more accurately…now wouldn’t that just make Rhys’ family’s day? Do it. Vote for Castro (and Barney and Rhys) and all your wildest dreams will come true. Cubs hitting coach, Rudy Jaramillo, believes that preaching patience to his hitters is what this team needs to succeed. Now, certainly a walk is better than a strike out. Heck, it’s better than just about any kind of out that doesn’t involve a sacrifice for a run. I don’t believe our problem has been getting on base any more than the rest of the league. Our problem has been getting guys around that are already on base. Timely hitting with men in scoring position, that is our problem. I understand young players like Castro and Barney get on a roll partially because of their talent and partially because opposing pitchers haven’t seen them before and haven’t figured out their weaknesses. I understand preaching patience to the young guns and pushing the philosophy down to A ball to keep the organization’s company line on point for when the young players hit the majors. Thing is…while it may help get one of the youngsters on base once more a game, the problem may just be that Jaramillo is preaching to a bunch of injured, often on the DL players. He is preaching patience to a bunch of patients. What good is preaching patience to a bunch of players that can’t stay healthy? What good is it to get guys on base and then not be able to knock in the runs? Who wants to lead the league in men left on base? I’m all for a high OBP. The Cubs are third in the National League in the category. Of course it’s difficult to clear the bases when you’re not getting the hits when the bases have a no-vacancy sign over them. It’s not like we’re not hitting for average. The Cubs are in second place in the NL in AVG, only a handful of points behind the St. Louis Cardinals. Currently, we are 7.5 games behind said Cardinals. We are getting on base and we are hitting for average. We’re not even striking out as much as you may think. Currently we are in 15th out of 16 teams in the National League in strike outs, only team striking out less than us: the Cardinals (of course). We aren’t quick to swing at poor pitches overall. We aren’t just taking a quick lap from the dugout to the batter’s box and back again very often. We aren’t having a hard time getting on base. Patience isn’t our problem. Timing is. I don’t know if even Jaramillo can teach timing. Patience? Sure. Wait for it. Wait for it. Wait for it. That’s easy. Heck, when you’re batting, patience and ‘wait for it’ calls for the hitter to simply stand there and not get hit by the pitch. As long as it’s not thrown directly at me, even I could do that. Patience is easy. Timing? Timing is hard. I’d like to hear Jaramillo start talking about timing and figuring out a magical solution to the lack there of. While the players are injured and taking a round-robin approach to the DL, patience is arguably wearing thin. Patience at the plate isn’t the problem. Patience in the bleachers and in the standings is where the patience is becoming an issue. At the plate, Jaramillo’s forte, timing is the problem. Time to change the company model to reflect timing as the point of focus in the batter’s box and get away from patience. With all the patients we’ve had lately and all the youngsters getting called up to replace them, now would be the perfect time. With injuries piling up this season to multiple Cubs starters, it’s important for us Cubs fans to stick together more than ever. It’s only May 31st so there is still a lot of baseball left to play and anything can happen but we need to get healthy fast, get our guys back on the field and turn it around quickly. It takes time to make up games, especially in a division as tight as the Central. Hopefully Garza comes back on Sunday and Wells improves in his second outing since coming off the DL. Once we start to stockpile our pitchers again, I feel like we have the offense to generate the necessary support. Just a matter of getting healthy and chasing the Cardinals, Brewers, Reds and Pirates as hard as we can. It would be nice if the Astros stay in the basement of the division. We dont’ need ANOTHER team to chase at this point in the season. I know many Cubs fans feel the frustration after a tough loss and the elation after a great win that I feel so I always find it interesting to get to know other fans, by more than their Twitter handle. If you are interested in being interviewed for a Prosecard of your own, email me at maloney_ryan@yahoo.com and I’ll send you some questions. You submit your answers and a photo and BOOM…we have ourselves a Prosecard. Here is today’s Prosecard from Cubs Nation from Ryan Aaron. Ryan loves his Cubs and has reason for MLB to eliminate the White Sox altogether. Check it out! Why are the Cubs your favorite baseball team? Living in Oklahoma City we do not get a lot of the teams. As a child I could always count on watching the Cubs play. Watching Sandberg and Grace on the field and Harry and Steve Stone in the booth was the best part of my baseball child hood. Best thing about having a family own the team as opposed to a giant corporation and also the worst thing: The best thing about it being owned by a family is because in most cases it will be ran like it is a family and not just everyone is a number there to make a profit. The worst thing about it is because with it being owned by a family is that the budget may not be as large and may not be able to pay the players we develop when it is time or go out and get the one or two players needed to finish the piece of puzzle during free agency. Player you enjoy watching the most and why: Starlin Castro because he always plays at 110 percent. He plays with a level of energy that you don’t see everyday. Whether it is in the field or at the plate he plays all out all the time. The Cubs are still chasing their next World Series title after nearly 103 years. What is it that they are missing? Why hasn’t happened in that time frame already? This is a tough one. I don’t think the answer is talent. We have had plenty of teams talented over the years. I guess it comes down to luck. I do not think the team is cursed but we have had a lot of bad breaks over the years. If just one of those goes the other way who knows maybe we hav e1 or 2 or 3 championships in that time frame. You are asked to write a brief column in between game 6 and game 7 of the World Series. Series is tied 3-3. Cubs win game 7 and the day we’ve all waited for will finally be here. What does the beginning of your column look like? Today is the day. Will it be the day we have all been waiting on or will it be another day of heartbreak? How will you celebrate when the Cubs finally win another World Series title? I honestly do not know. I am sure there will be a lot of happy tears and adult beverages though. You are offered a job to design a new logo for the Cubs. What would the logo look like? I would mix in a little bit of the current with the C and bring back the original logo with the bear holding the bat. MLB has to cut one team for financial reasons. They have narrowed it down to the Brewers, Cardinals or White Sox. Which team would you recommend they lose and why? The White Sox would be the team I would contract. Why because the Cardinals are one of the historic teams in baseball and the rivalry with the Cubs is like none other, it is known world wide. The Brewers are a team that that when we go to there park it is like another home game Wrigley North. The White Sox are like the little kid down the street to me the one that no one wants to play with. They do nothing to help us and nothing to hurt us. They are just there. How would you describe what it is like to be a Cubs fan? It is a roller coster no one has ever rode before, we have our ups and downs every year, but they are different than any other team. The Cubs have won the World Series. You are writing the Tribune’s headline. Give me 3 samples of how you would have it read. HOW SWEET IT IS!!! !, CUBS WIN! CUBS WIN! GO CUBS GO! Thanks Ryan! Hope our Cubs get healthy and headed in the right direction in the standings ASAP! In-Game Season Anxiety Index – How Do You Feel? It is currently in the bottom of the third inning in today’s game against the Pirates. Last game of the three game series. Fukudome just hit a leadoff double. I want to know how you feel about the season so far. The Good? The Bad? The Ugly? Let me hear your thoughts as today’s game unfolds. Stop yelling at the TV or telling your friends how much you love such-and-such about the Cubs. Let me hear what you’re thinking about the season so far right here, right now. Looking forward to hearing what everyone is thinking up to this point. Go Cubs Go! A win against the Pirates? Lately, that’s very rare. Did it happen today? Nope. Not today. Aside from a blast by Soriano in the ninth inning to cut the deficit in half, the Cubs weren’t able to come up with much of anything today against the ‘Buccos’. I don’t care for that nickname when it comes to the Pirates. And I don’t care for the fact that they have become a giant thorn in the Cubs side. Doug Davis once again proved that he is not the answer in replacing Wells or Cashner. Add him to the list of guys who have auditioned for the spot and as Randy Jackson would say, “I don’t know, Dog. For me, it was just a little too pitchy”. Ha. Word play. Anyway, you understand what I’m getting at. Any Cubs fan familiar with the pitching problems we’ve faced since the season started understand what I’m saying. What was painful though was seeing Coleman warming up after Davis did nothing but give up a couple runs. COLEMAN? Isn’t enough that we have to see this kid pitch every five days while filling a rotation spot? Now we have to see him in spot relief as well? I mean, I understand he threw what….five pitches in his last outing before handing the ball to ICEBerg…but still. Every time I see the names DAVIS, COLEMAN, RUSSELL on the back of jerseys it makes we even more anxious for the return of our true four and five. Thank goodness Zambrano’s doctor visit came up negative and any stiffness he was feeling in his neck turned out to be no big deal. We couldn’t take that right now. Dempster and Zambrano need to be patient and wait a little longer for their turn if they plan on packing their bags and booking a trip to the DL this season. Let’s wait for Garza, Wells and Cashner to send their Prosecards and tell us how great their stint was before we get Z and Demp on Travelocity looking up flights and hotels in sunny, warm, tragic DL-land. Need to clean up the errors in the field and by clean up, I mean stop them. No more. We are too far back now to allow any unearned runs. Let’s make up some ground with quality baseball and then perhaps think about booting ground balls around the infield. At least give us time to get the rights to the Benny Hill theme song and we can make a real show of it one day in late August when we’re battling for first place and we just laugh it off as a fluke as we continue to blow away the teams we face. (Wouldn’t that be nice?) If we are going to help ourselves and pick each other up, a good place to start would be the ground balls. We pick those up and we could put an end to the unearned and earn our pitchers some W’s. I still hold on to the goal of a 7-2 home stand. Of course, that would require winning the next five. However, we took the Mets series 2-1, so if we do that to Pittsburgh then we get the Astros who are sitting in the basement of the Central. And what team makes the most sense as far as sweeping is concerned? The one in the basement. Ha. Word play. Wins against the Pirates have been a rarity recently and that needs to stop. Period. I want back in to the days where I could say ‘We’ll Always Have Pittsburgh’ and I’d like to revisit it as such tomorrow. In the meantime, here is something else that is rare. I came across it on-line just searching ‘rare Chicago Cubs film’. Thought it was pretty cool and wanted to share (like the way Pittsburgh hopefully shares the W’s. One for them…one…two for us. Sounds fair. Enjoy the footage). Go Cubs Go! Dear Pittsburgh, I Think We Need A Little Space. Nearing the mid-way point of this nine game home stand, next up: the Pittsburgh Pirates. Division games often make the difference at the end of the season. Now is the time to pull away from the Pittsburgh Pirates. Sitting side by side like Siamese twins sharing the fourth spot in the NL Central, the Cubs and Pirates are both clawing away as best they can to see what the Cards and Reds are up to atop the standings. Hoping the hole they are standing in isn’t made of quicksand, they’ve got their shovels out trying to dig their way out of the hole they dug themselves. Like watching two people doing their best to recover from a slip of the tongue, Cubs fans will be rooting for the Cubs to successfully do so and hope the Pirates end up packing up their things and asking for room in the basement next to the Astros in the basement of the division. As expected, the Central is turning into a four team race. After this series, one of the two teams will have separated themselves from the other and hopefully it’s the Cubs joining the Brewers, Reds and Cards and not the Pirates. It is so hard to make up ground in this division as we’ve seen recently. Feels like in the past couple weeks, while the Cards have picked up a couple games on us, every time the Cubs win, the Cards win and when we lose, at times they still win. It gets frustrating to win a day game and hope you pick up a game that night, only to watch St. Louis maintain their lead. It’s a tough division, I know, but Pittsburgh, you’re getting a little too clingy. Enough is enough. We need a little space. The Cards, Reds and Brewers all get to play the Pirates and Astros as many times as we do. Chances are they are going to take care of business. This week is our turn, our shot at winning the games we need to win to contend. Four games over the Astros, we’ve done a good job stiff-arming Houston in the standings. It’s time to do the same to you, Pittsburgh. Not too long ago, Pittsburgh might as well have been a difficulty rating of just above an off day or batting practice. A young team fighting desparately to become relevant again after 20+ years of coming up short, they are slowly getting better. Recently, the Pirates are making it a series against the Cubs and at the end of the year, like last year, the Pirates even took the season series between the two of them. Chasing the Cards is one thing. First thing’s first though…we need to pull away from Pittsburgh. We’re trying to achieve something here and you are cramping our style, Pirates. Doug Davis on the mound tonight. Remember Doug, these are the Pirates. Not the Red Sox. Get the W. Go Cubs Go! Think My Family’s Excited About Taking the Series From the Mets? A picture is worth a thousand words…or at least one Jib Jab video. Feel free to play the video above before reading the rest of the post. What a great game today. Another laugher as the Cubs take two out of three against the Mets to kick off their nine game home stand. If we were allowed to play all nine last night, then perhaps we would have come back and found a way to sweep them. Unfortunately, the rain had other plans and the Mets escape the broom. I believe if we don’t get out of Wrigley with a 7-2 record this week against the Mets, Astros and Pirates, then it’s a giant missed opportunity to make up some ground. If we take the next two series 2-1 that puts us at 6-3 for the week so we’re now going to have to sweep either the ‘Stros or the Pirates. Would love to see that happen. Zambrano looked great today as he was dominant on the mound and went 3-for-3 at the plate. Is he fun to watch hit, or what? Pena finally defeated the wind and went yard to put the Cubs ahead 2-1 early on and the rest of the team followed suit. Lots of timely hitting and hustle from the youngsters again and it’s fun to see guys like Campana, Castro and Barney make a difference in the line up. Granted, Campana kind of looks like that punk kid that end up in the Bad News Bears sequels after Amanda was no longer pitching, but hey who am I to hold that against him. The kid is a welcome sight. I just can’t believe yet another hurdle has been presented in Colvin’s career with the Cubs. With Campana contributing it may take another outfielder to go down with an injury for Colvin to see the big league stage again any time soon. The Mets continued their struggling ways at Wrigley as expected. If it wasn’t for an outing by Berg painting the picture of a call that could have been made by fictitious Indians’ broadcaster, Harry Doyle, perhaps the brooms are out of the closet. I’m hoping this wasn’t our best chance at it among the three opponents we’ll see but something tells me it was. Still shooting for that 7-2 at the end of the home stand and hopefully the Cardinals will do their part and lose along the way. Great series and I’ll be talking about it tonight as a guest on a Mets podcast called Mets Public Record. Looking forward to it. Way to go Cubs. Keep it up. Go Cubs Go! JIB JAB! Get well soon, Marlon. Go Cubs Go! The Cubs were the victim of mother nature tonight as their game against the Mets was cut short. Half way through the top of the seventh inning, the umps finally called for a rain delay and ultimately the ballgame on a soggy night at Wrigley. Quade was pretty upset that his team didn’t at least get to finish the seventh inning down by three runs so he’d have a shot to tie the game. According to Quade, it wasn’t raining any harder when they called for the tarp than it was a couple innings before. Good to see the fire, Quade. Keep it up. So, Thursday is now the rubber match between the two clubs and I like our chances with Zambrano on the mound. The Mets got lucky tonight as Berg had a meltdown of epic proportions. His fastballs looked like Steve from Blue’s Clues, wondering hopelessly unable to find it’s target no matter how much the people watching yelled at him to locate the strike zone. It was an ugly scene, hopefully one he can shake off while he’s still with the club. Coleman also had a miserable outing. Unfortunately that’s what we get with three of our five starters out with injuries. You have to hope the replacements can step up and if they can’t, you have to hope you at least get your nine innings to make up for their poor performance. Neither happened tonight and now the three game series is tied at one game a piece. To make up for the lost baseball this evening, here is a video of an old home run derby between two retired numbers between the Cubs and Mets organizations respectively. Ernie Banks and Gil Hodges. You have to love having this kind of access to old-school baseball moments in history. Enjoy…and Go Cubs Go! We got the Mets at exactly the right time. They are low on talent. Low on pitching. Low on ‘superstars’. And perhaps the most important one of all…low on morale. Yesterday’s game was a laugher. It was the perfect way to kick off the nine game home stand, a crucial one for the Cubs. That second inning was a beast. The Cubs got on base and got on base and got on base unlike no other game I remember. We were relentless and it was somewhat refreshing. RISP you say? No problem. WHAM…a single. BOOM…a two RBI double. The hits piled up and the runs were doing their best to keep up. The Mets had no shot of keeping up with the Cubs yesterday. It was as if the offense timed itself with the ivy. Both were seemingly in full bloom and looked spectacular. Dempster got his legs under himself after the first inning and then cozied up in the warm nook of a five run lead after two, never to look back. The need of this team that stood out the most immediately resulted in stand out players. With guys down like Soto, Byrd and Baker, we need these young kids to step up and make a difference. Maybe Pena reminded them of what it was like to have a dominant young force in Tampa Bay a few years back. These kids put on a show and it was fun to watch. Heck, even Soriano, Ramirez and Hill joined in on the fun. Aside from Quade giving Castro an earful after a baserunning error, the team was nearly perfect yesterday. The Mets? Not so much. In many ways, these two teams are very much alike. Many injuries and poor positioning in the standings. Yet in many ways, they are very different. The key one being morale. After the weekend series against the Red Sox, losing two of three plus their lone All-Star of last year and a strong number 3 in the rotation, you would imagine the team’s morale being extremely low. However, that kind of low morale isn’t the same type of low morale the Mets are experiencing. Injury and tough loss morale is much different compared to ‘jerk boss’ morale. The Mets are suffering from Jerk Boss morale. Have you ever had a jerk boss? I have. Not only does having an abusive boss make doing your job more difficult, it makes it very hard for you to even want to. Nothing says stick it to the old guy with the ‘nothing-but-sh*tty-things-to-say’ attitude like an 11-1 loss. You think we stink? Alright fine, we stink. Now are you happy? William Shea must be turning in his grave watching this organization implode. Shea fought to bring a National League ballclub to New York after the Dodgers left in ’57. He threatend MLB with an additional professional baseball league called the Continental League. Afraid of competition, MLB gave in and gave NY one of two new teams in the expansion (the Astros being the other who were then the Colt .45s). He poured his heart and soul into the effort and the team named their second home after him. First home: Polo Grounds. Second home: Shea Stadium. Nowadays, the Shea Bridge that leads to concession stands in the outfield is named after him at Citi Field. I’m starting to think he must be thinking thanks but no thanks after watching what Wilpon has done to his beloved team. The Mets are in trouble in more ways than one and luckily, we have them right where we want them. Losing 11-1 is no way to defeat a low morale problem and here they are, in our home at a disadvantage being on the road. We need to keep pounding them and be sure to sweep. The Astros and Pirates are must win series as well and I expect us to. However, this Mets series is a different kind of opportunity. These guys are as low as it gets. It’s time to step on the gas as Keith likes to say and keep the runs piling up. (Maybe not by putting one of our only two starting pitchers out there to pinch hit – Quade, I understand guys like to have fun and it probably will help morale overall but- please be careful with Zambrano and Dempster. They are the only two quality, healthy starters we have left). Another night game tonight against the Mets. Gee v. Coleman. Coleman took advantage of a friendly atmosphere in Florida to start turning his season around. Tonight, the Mets will provide another great opportunity. Go Cubs Go! It’s official. The Cubs sent Matt Garza to the DL today to hang out with the rest of the Cubs potential All-Stars: Byrd and Soto, Pitchers: Wells, Cashner and 2011’s Mark DeRosa: Jeff Baker. Wow, this is a lot to be up against when trying to make up ground in the Central. It seems like every day that passes, you hear about a Cubs injury and then as soon as you accept it and move on, convincing yourself all will be well with the Cub world and we’re back on track regardless, the DL Land Shark comes a’knockin’ at the door again! Well, I say ENOUGH with the ‘candygrams’. I believe in Quade and what he can pull out of a hat with this team, but come on. The man needs his pieces! The Garza listing is a real blow to the already patchwork quilt of a line-up/rotation Quade is continually forced to put together. I know Cubs fans must be concerned. Am I right? Do all of these injuries to your favorite ballplayers have you down in the Demps, er dumps? Better to laugh about it than cry! Here are some videos I thought might lift Cubs fans spirits while browsing the DL. All of them involve something with great potential unexpectedly hurt by non-sense or absolute catastrophy. Sound familiar? In a season constantly interrupted by chaos and roughly 50% of the games going essentially win, lose, win lose…I think these are perfect for a laugh and to symbolize the up and down nature of the team’s health during the 2011 season. Especially the second video. Every time they react to a Michael Bolton interruption it looks and sounds a lot like I do when I hear about another injury to a Cubs player. You’re welcome. Mets/Cubs tonight. Can’t wait. Let’s hope the injuries stop here. We can’t continue this trend. We’re already short on quality to bring up to the Bigs to replace the key players we were counting on. I felt like we could compete with the group even with Hill at catcher and hoped that Russell or Coleman would catch on. Now that Byrd and Garza are in trouble, please…attention baseball injury gods…ENOUGH ALREADY. Thank you. Tonight kicks off a nine game home stand for the Cubs and we sure could use some good news at the end of it. Against three of the lowest representations of major league talent the league has to offer, the Mets, Astros and Pirates come into Wrigley this week for three games a piece. Are they catching the Cubs at a good time? Absolutely. The injury list up to this point of the season tallies up key losses: Wells, Cashner, Soto, Garza, Byrd and Baker. All of them were supposed to contribute an extreme amount to the Cubs drive to a winning season. And now? None of them more than likely, will be available for any of the three series. Their replacements? Russell, Davis, Coleman, Castillo, Hill, DeWitt, Johnson and for however brief a period of time, Montanez. Talk about a needing your bench and back up guys to step up and play hero for a stretch of time. The Cubs came into 2011 with a starting rotation of three solid starters and then two guys we were hoping we’d have at least .500 records from come the end of the season. Dempster was about to get his turn in the ‘let me be the ace’ rotation that he’s taken a back seat previous years to guys like Lilly and Zambrano. Zambrano came off as a bigger head case than Mr. Potato Head last season and no one was really sure what to expect in 2011. Sure his second half of 2010 was impressive, but it had to be in order to help make you forget about the first half. Garza came in like the hot girlfriend that moves into your place that you think it’s good idea to have her around and you think there’s great potential. Thing is, she’ll only move in if you get rid of a bunch of your stuff. Some of those things are harder to let go of than others but you give it a shot because hey…this could be the beginning of a beautiful relationship. And then there was Wells and Cashner. Wells treated us to a ‘See’ season in 2009 and then the frightening ‘Saw’ season in 2010. Unsure of where 2011 was headed after Spring Training, he earned the number four spot in the rotation after doing enough in the pre-season. Same with Cashner who essentially stepped up long enough to yell ‘shotgun’ to get the five spot considering the other possibilities had stat lines in Spring that yelled ‘not it’. It wasn’t but two weeks into the season and Wells and Cashner were gone leaving only what turned out to be a shaky Demp and high in the ERA, low in the crazy Zambrano (which yes, we’ll take if it leads to wins yet may not be as entertaining). Garza has put up an impressive amount of strike outs however they haven’t translated into too many wins on the days he pitches. And NOW, Garza is out with tightness in his throwing arm, his elbow concern pulling him from the series finale at Fenway. I feel like if we had Garza on Sunday, we would have taken the series against the Sox and team would feel great heading back to Wrigley for this homestand. However, we didn’t have him. We didn’t win the series and on top of it all…while our pitching became furhter comprimized, our line-up took some shots as well. One of them literally, as Byrd took a fastball to his left eye socket and is out indefinitely. The other being Baker who pulled up lame turning a shot to the wall in Boston into a double (capped off with an injury induced, ugliest slide I think I’ve ever seen). The players that are on the DL were key pieces in Quade’s plan for success. He now must make due with a make shift line up of bench players and spot starters. The team needs help and they can only look to their bench and their bullpen. No one else is going to get it done. They have to step up and help each other out until the expected superstars of the team get back. The good thing for this week is, the opponents are in a similar position. The Mets have what they were pitching as superstars in their pre-season ticket sales push, only in recent days their owner has come out and trashed the faces of the franchise. Wilpon said that Reyes is essentially an injury waiting to happen that will never get star money, that Wright has a nice smile and an ok back of a baseball card but is no ‘superstar’ and while they have to pay Beltran 100% of the money due to him, he’s only offering 60-75% of his former self day in and day out because he’s simply not the talent he once was. They have suffered injuries in the rotation and made up for it by signing arms from the land of misfit pitchers hoping for the best. This team is in no better shape than the Cubs, especially with key players like Wright, Santana, Pagan and Ike Davis on the shelf with injuries. They too are looking for help from within. The Astros are struggling and holding down the fort they’re having fun building in the basement of the NL Central and surprisingly, the Pirates of all teams will probably end up being the toughest team we face on the homestand. I still can’t believe we are behind them in the standings. At the end of the day though, they are still the Pirates and they can always use all the help they can get. I believe we are still at a slight advantage given the talent we have as backups and the fact that we’re at home for these games. I expect a record of 7-2. Anything less than that will be a missed opportunity to make up some ground this week in the Central (as long as the Cards cooperate of course). To play us out, I submit this tune as the soundtrack of the upcoming nine game homestand. Enjoy…and Go Cubs Go! Today’s Prosecard from Cubs Nation is from Christopher Petersen! We’re all in this thing together…might as well get to know one another! If you’d like to be interviewed and featured here in a Prosecard, email me at proseandivy@cubsmvp.com and I will send you questions to answer. That and a photo and you are good to go! Big week coming up with a nine game homestand against the Mets, Astros and Pirates. Would love to see us go 9-0. It’d be tough, but against these three troubled franchises, anything is possible. I’m sure Christopher would agree. Here is his Prosecard from Cubs Nation…check it out! Prose and Ivy: Why are the Chicago Cubs your favorite baseball team? Christopher Petersen: My best friend in grade school was a huge baseball fan in general and a Cubs fan specifically. So, although I liked watching the games already, he sort of solidified me as a Cubs fan. When I was seven years old in 1984, I wasn’t fully aware of what I was in for. But I got into watching the games, and I became fascinated with listening to Harry call a game. Even as a kid, I knew he wasn’t doing the greatest job, but it always sounded like he was having fun, so it was fun. Being a Cubs fan also sort of fits my personality a bit, because I hope for the best but prepare for the worst with pretty much everything. P&I: Who is your all-time favorite Cub? CP: I grew up as a huge fan of Sandberg/Grace/Dawson, but as I learned more about the team I came to truly appreciate Fergie Jenkins. His accomplishments, especially in terms of his durability and complete games, seem almost mythical today when you compare them to modern pitchers who can’t stay healthy for an entire season, even with pitch count restrictions and modern conditioning. But Dawson would have to be my all-time favorite simply because of the legend of the blank check. To see a guy express as much appreciation for the team as a player as you do as a fan, it’s something rare. He knew how fortunate he was to play baseball for a living, and he let the fans know how much he appreciated their support. P&I: Who is your favorite Cub on the current roster? CP: I’ve always been a staunch supporter of Carlos Zambrano, even when I know I probably shouldn’t be. He’s a big fat crazy idiot, and I see some of myself in that because I myself am a big fat crazy idiot. P&I: The Cubs are wearing patches with the number 10 on them this season in honor of former Cub player/broadcaster, Ron Santo. What is your favorite memory of Santo? CP: I was born too late to ever see Ronnie play, but on the radio he was a truly unique figure. There’s no doubt that he wasn’t the most polished broadcaster, but he was always entertaining. My favorite memory was of a game in 2008 against the Dodgers. The Cubs had built up a mostly comfortable lead before a series of soft hits brought L.A. back into the game. Ron had been growing more and more agitated with each Dodger run, and when the last bloop single hit the outfield grass, he just started shouting “WHY? WHY? WHY?” It’s become a go-to expression of anguish for my wife and I since then. Ron had a way of making every game the most important game of the year, which was emotionally exhausting at times as a fan, but you knew he was always sincere. And that’s more than you can say for a lot of broadcasters. P&I: Would you rather be in attendance to see a regular season perfect game thrown at Wrigley or a playoff walk-off home run? CP: Now, this question feels like a trick, because a regular season perfect game at Wrigley could technically be thrown by an opposing pitcher. I have a feeling that if I said “perfect game,” I would get to my seat and have to watch the Cubs get blown away by Wandy Rodriguez or something equally humiliating. The playoff game is more important anyway, so I’m going with the walkoff homer. P&I: The Cubs marketing department comes to you, asking for ideas for a new slogan for the 2011 Cubs. List three or four ideas you would suggest. P&I: What is your favorite Cubs game of all-time? Why? CP:That’s a difficult one to answer – to me every win feels just as good as the next and every loss feels just as bad. I guess the one that sticks out most in my mind was one from 1992, the game against the Cards where Jim Bullinger homered in his very first major-league at-bat. It sticks out to me because it was such a bizarre, random occurrence – the kind of thing that only happens in baseball. P&I: If you could change one thing about Wrigley what would it be? If you fought to keep one thing the same, what would it be? CP: I’d really like to see the park modernized to a certain extent. I know that’s practically heresy to a lot of people, but when you understand just how outdated the players’ facilities are, you have to feel like they’re at something of a disadvantage. I want the Cubs to get clubhouses and training facilities as good or better than the best in the majors – because it can’t be easy to break a century-long drought when your home is practically as old. Obviously, I’d like Wrigley to maintain as much of its charm as possible, but the priority should be making the ballclub into a champion. As for what I want to keep the same, I want the Cubs to stay at Clark and Addison. Being in the middle of a neighborhood is what makes the ballpark unique in the majors, and I can’t imagine going to a Cubs game in the middle of a gigantic parking lot. P&I: You’re assembling the greatest Cubs rotation in history. Who are the five pitchers you would select and why? Carlos Zambrano – He’s had a rough couple of years since 2008, but he averages about 8 strikeouts per 9 innings when he’s on his game. Greg Maddux – Not only is he one of the best pitchers of the last 30 years, but he supposedly has an uncanny ability to see how a game will progress – a valuable skill to have on the bench. Fergie Jenkins – Should be obvious; one of the most durable, most reliable pitchers ever. Grover Cleveland Alexander – He has a lifetime ERA of 2.56, and posted an ERA under 2.00 six seasons in a row. Mordecai Brown – A career WHIP just a hair above 1 at 1.066, and one of the most baffling deliveries in Cubs history thanks to his “unique” hand. P&I: Sammy Sosa hasn’t worn a Cubs uniform in years. As a fan, what are your feelings regarding Sammy Sosa as of today? Are they different than they were when he was a Cub? CP: I look at Sammy the way you would look at a crazy ex-girlfriend. You had a ton of fun while you were together, even though you knew in the back of your mind that something wasn’t right. Now that it’s over, you look back and realize you weren’t in the right frame of mind at the time. P&I: Which season did you feel was actually going to be ‘the year’? One more than any other and why? CP: I try not to get too excited at the start of any season, regardless of how good the team looks on paper. This helped me out immensely in 2009 as that whole thing crashed and burned. I’d have to say 2003 just felt differently, up until those last two terrible days. There were reasons to feel confident, even after Game 6 happened. You still had Kerry Wood pitching Game 7. There was no reason to panic, even though every fiber of your being as a Cubs fan was wracked with anxiety. But then, it all fell apart anyway. Oh well. O-blah-dee, o-blah-dah, and all that nonsense. P&I: The Cubs have won the World Series. You are writing the headline for the next day. How would you have it read? Three or four examples would be great. P&I: How do you plan on celebrating a Cubs World Series victory if we are lucky enough to have it happen in our life time. What would you do? CP: If I do see the Cubs win the World Series, it will certainly be one of the happiest moments of my life, but other than an immense feeling of relief it won’t really change anything. I’d celebrate by having a few drinks with my friends, taking my wife out to dinner, then probably hanging my “W” flag outside my house for the rest of the year. Then, once the next season starts, I’d roll it up and put it away until the next time they win the World Series. The image of the baseball hitting Marlon Byrd in the face is one I am having a hard time shaking off. The second image, the one of him thrashing around home plate on the ground from the pain is even more disturbing. Marlon Byrd is the type of player that can carry a team when he’s on a hot streak. When his bat hasn’t quite hit it’s stride, he’s still a Cub that is fun to watch because you can tell he takes pride in being here and playing for Cubs fans. To see interact with the fans in the bleachers at Wrigley is one of the hidden gems of the Wrigley Field experience. The friendly jabs back and forth. The willing conversations with kids and adults alike. The dancing, the pointing, the smiling. Marlon Byrd is possibly the most likable player on the team which is what makes this injury all the harder to take. I wouldn’t wish getting hit in the face with a fastball on any baseball player. Not a player I dislike and of course certainly not one I root for on a regular basis. The league is doing more to test out new helmets to help with preventing concussions that occur as a result of beanballs. Thing is, when you are unable to get out of the way and one of those pitches catches you in the face…not a whole lot you can do about it except go down hard and hope for the best. Think about the highlights you’ve seen on Sportscenter…all the times you’ve seen them play that disturbingly loud PLUNK sound of a baseball hitting a batting helmet. You’ve seen the concern of players in the field and teammates in the dugout when they show those shots. Of course, they generally show the reaction once and the plunking about 30 times in a row. To see the concern on those players when a beanball happens off a batting helmet is one thing. You know it’s a big deal when players on the other team have looks on their faces like Youkalis did for the Sox. He looked absolutely horrified and rightfully so. Regardless of which uniform he is wearing, no player wants to see another player take a fastball to the face. And if they are concerned, players who have ‘seen it all’, then you know it is something to be concerned about. As soon as it happened I thought of the scary episode baseball experienced earlier this year with Atlanta Braves minor leagues manager, Luis Salazar getting hit in the head with a foul ball and then slamming his head to the ground on his fall afterwards. He has lost the eye and his life will never be the same. Coaching like that can’t be easy…it would be impossible to play. My number one concern is Byrd’s health and vision. Number two would be his ability to play. When you start to talk about injuries to the head, you can’t mess around or take it lightly. The Cubs need to take this very seriously and take care of Byrd. He is an important part of the line up and fabric of this team however they must not rush him back…if coming back is an option at all. Nothing would be sadder than to see a player in his prime, loving playing for the Cubs, have his career cut short because of this type of play. The head is just such an intense opportunity for brain and vision injuries, maybe the league needs to go even further to protect their players. Facemasks? I don’t know, not necessarily…but maybe. My friend, Paulie Malignaggi, is a professional boxer. He fought the fight of his life at Madison Square Garden a few years back against a real brawler. It was a title match against the very talented and very strong Miguel Cotto. I produced a documentary of his training leading up to the fight and then we were there filming on fight night. Paulie performed to his best ability and made us all proud of him. While he did not win, he was impressive in defeat. I couldn’t believe he went the distance considering in the third round, he broke the orbital bone on the left side of his face (the bone below the eye/lower part of the eye socket). I couldn’t imagine the pain he must have been in and was concerned for his well-being, his career and his vision. Luckily, Paulie healed and went on to continue his boxing career. Sometimes though, athletes can endure the same type of injury and not come out of it as lucky. This Red Sox/Cubs series is something I’ve looked forward to because I predicted Cubs/Red Sox in the 2011 World Series. Game one was exciting until it turned into a giant blow-out loss. Game 2 was more fun as we ran off an 8-run 8th inning. Thing is, the game 2 success was greatly affected by the fact that one of our Cubs went down with a serious injury earlier in the game. Perhaps it’s because I have first hand experience with an injury like this, knowing someone who has suffered facial fractures/broken bones around the eye. I know how serious it can be and maybe that’s why I’m having a hard time shaking the Byrd injury off. I can’t wait to hear an update and I very much so hope Byrd is okay. I realize he is a baseball player and not a boxer. It’s not like it was ten rounds of continuously getting hit in the face with a fastball. One shot, that was all. But to think about seeing the pitch hit him in the face and then him flailing in pain on the ground…a concussion would be one thing and I believe the team will handle his injury well and look out for Byrd’s health. As of right now, his vision is my real concern and I’m hoping for good news about his condition soon. Even more so than a Cubs win this evening. Hoping for the best re: Byrd and that his teammates will one for him tonight. Would be a great start to what could be a long road back to the playing field for Marlon. Go Cubs Go. Before this weekend’s series at Fenway Park, the last time the Cubs appeared in a game that mattered there was 1918. It was the World Series and as the result of a shortened season due to the world being at war, the two teams at the top of their divisions were selected to play for the championship. Those teams were of course, the Boston Red Sox and the Chicago Cubs. 1918 is a Series that ended up in the W column for the team from Beantown. That year would haunt them for 86 years until their next championship. Yankees fans would chant NINE-TEEN EIGHT-TEEN at the Red Sox year after year as they would meet their AL East division rivals in the playoffs in what felt like every single year (although realistically that was not the case). The Cubs on the other hand, are still waiting to capture their ‘next’ title and the last one occurred 10 years before the 1918 Series. In a decade that featured arguably the best Cubs teams of all-time, they would unfortunately come up short (possibly to their own accord, according to documents recently released) and the memories they would have of Fenway Park were not exactly fond ones. 93 years later, a Cubs team would finally step back into Fenway Park for games that counted. Not playoff games mind you (although I do predict that’s how 2011 will play out). A weekend series that has the entire MLB fan base watching primetime matchups between two of the most storied franchises in the game. It’s definitely a series I’ve kept my eye on since the schedule was released and I was // this close to heading to Boston this weekend to take a game or to in, in person. As it is, while Wrigley Field is the best place to watch a baseball game, arguably, Fenway Park is the second best (and some fans would even flip flop those two). The two oldest ballparks in the major leagues, it’s amazing how high they rank in the eyes of baseball fans. The casual fan would think that the newer parks featuring all kinds of replica throwback feel plus the technology and comfort of modern day would be the favorites of fans. However, as it turns out, while some of the newer amenities are nice, the replica throwback effort often comes across as trying too hard and nothing can match the true feeling you get when you walk into the real deal. Wrigley Field and Fenway Park, while receiving slight updates and additional seats over the years since the 1918 match up, are still the truth when it comes to our favorite past time. They provide fans with a home to celebrate their team game in and game out and the opportunity to relish in the history of their beloved franchises as it surrounds them inside the ballpark every where you look. There is no need to reference a key part of the stadium or the field where something amazing or magnificent happened throughout the years. No need for pictures or museums. Whatever is there to celebrate the past is simply by choice, not be necessity. All of the areas of the ballparks where those special moments occurred are still there, right in front of you, getting groomed and prepped by the grounds crews each and every season. The two parks are special in that way and nothing else in the league is, can or will ever be quite as magical as them. The 1918 Series is something the two teams have in common. The fact that their ballparks are such true relics to the history of the game is certainly another. I was sent a review copy of a book called ‘Remembering Fenway Park – An oral and Narrative History of the Home of the Boston Red Sox’. It’s a great book and I wish they did one for Wrigley Field. My favorite thing about the book is the way it manages to cover the history of the park from both the inside and out. What I mean by that is, not the outer walls and inside of the park, but the way it reviews the history of the stadium as an observer in addition to the quote, emotions, memories and thoughts shared by former Red Sox players who played many, many games at Fenway. With a foreword by Johnny Pesky, immediately you are taken to a place that gives instant credibility to the author. The stories told by the players give you an inside look as to what it is to be a Boston Red Sox player and the images that accompany it are spectacular. Some of my favorite images are those of the spectators. I wonder if we’ll ever get back to wearing suits and fedoras to the ballpark. They say what’s old will be back and become new again. To see Fenway Park expand throughout the book is also a very interesting aspect. It is like a time capsule reference of the business plan blueprint the organization took throughout the years. How to make more money…where to put more seats…how to get more people to the ballpark. Baseball is a beautiful game with it’s measurements from mound to plate and from base to base. However, while the talent on the field is a spectacle to behold, the game is also a business. The owners of the team throughout the years clearly understood this and it’s fascinating to see them maintain the honor and reputation of the park as a landmark of the sport while still finding places to build here and change there to increase the seating capacity. If they had made mistakes or errors along the way, they’d still be selling out to large numbers, however, fans wouldn’t feel the same way they do about the ballpark. Opening Day line ups of the teams throughout the years from 1912-2009 is also a great resource in watching the team develop like an amoeba. Young stars come up to the league early in the book and you watch their careers develop until they leave you as a respected, beloved veteran at the end of their careers. This happens constantly and it is also an interesting way to see how the Red Sox have handled the ballclub throughout the years. Who did they keep? Who did they trade? Who did they sign? It’s a record of nearly 100 years of business decisions that have made the Red Sox the team they are today and Fenway Park the stadium we all know and respect. Wrigley Field deserves this type of treatment. I know that there are NUMEROUS books out there about the history of Wrigley Field and many of them are quite good. However, aside from no World Series title reference next to the year 1918 in the book and the dates listed as 1912-2010 (which I feel gives the impression that Fenway closed in 2010…I maybe would have listed it as ‘Since 1912’ or something to that effect), the author, Harvey Frommer, does it right. If he already has encapsulated the history of Wrigley Field, then I want someone to tell me where I can get it. If he hasn’t, then let this be my official ask that he do so. Baseball fans will love this book even if they are not Red Sox fans. I would encourage you to find it, buy it and enjoy. Rubber band match tonight. Cubs at Red Sox. One more game that matters in the books for 2011 at Fenway Park tonight on Sunday Night Baseball. Garza is out with tightness in his shoulder. Byrd still hospitalized from being hit in the face with an Acevedes pitch. While my thoughts are with Byrd and I hope for GREAT news as far as he’s concerned and I wish Garza could represent us in this third game against the Sox, it will be fun to see one more game against the Sox at Fenway……and I hope we get seven more this post-season. Only this time, I want the Cubs to walk away with the title and I want to be there. That’s how I’d like to remember Fenway Park. With Marlins Swept, Time To Ship Up To Boston! For the first time since 1918, the Chicago Cubs will be visiting historic Fenway Park. At that time, the two teams were facing each other in the World Series. A time before curses. A long time before blogs, MLB Network and 24 hour sports radio/television. What was at stake may have been greater back then, but there will definitely be more people watching this time around. Back in 1918, players weren’t paid more than about $5,000/year and World Series championship bonus could run up to 20% of that total. With no guarantee of winning, there are rumors that players were willing to throw away a shot at a title and bonus money for the guaranteed payday that came along with throwing the Series. The Red Sox won the World Series and lately, people have questioned whether the Cubs handed it to them on a silver slugger plate. I like to think that they didn’t. I like to think the corruption started in 1919 with the White Sox and the Black Sox scandal. The book/film, Eight Men Out fascinated me when I first came across them and the story of Shoeless Joe Jackson, made famous in the film ‘Field of Dreams’ was one I was infatuated with for a while (still am today). How could anyone throw away the opportunity to win the World Series? I suppose now that I have a family of my own, I can understand the pressure to provide. I also know what it is to feel unfairly treated by an employer who is making millions. Considering the way owners treated players back then, as much as I’d like to believe it wasn’t the case, it’s hard to say the Cubs didn’t possibly contribute to the Red Sox success that Series. This upcoming weekend series at Fenway, it’s just that. A series. Not a Series. Nonetheless, the fact that it’s been nearly 100 years since the Cubs played at Fenway against the Red Sox (the Sox have visited Wrigley in a regular season inter-league game since) is a big deal and all eyes will be on Fenway Fri-Sun night. I wanted to get tickets and drive up to the old ballpark but it wasn’t in the cards. Regardless, I can’t wait to see this showdown. You think a stretch against the Reds, Cardinals and Giants is a true test of where the team stands? Try facing the Boston Red Sox. After a slow start they are starting to fire on all cylinders. The favorite selected by many to win it all in the pre-season, individually and as a team are now hitting their stride. Once buried in the depths of talent in the AL East, the Sox are scratching their way back to the top of the standings, an effort I’d like to see come from the Cubs after their own slow start this season. Two games against the Marlins in Miami is a great appetizer and a wonderful opportunity to finally get some sun and warm up a bit. However, the Marlins are no Red Sox and their ballpark is no Fenway. As excited as we are as Cubs fans for this weekend, you’d have to imagine the Sox fans are looking forward to it just as much. To experience the historic match-up and possibly to cheer their team on to victory and spoil the visit once again for the Chicago Cubs 93 years later. Interleague play has opened up the opportunity for these types of match-ups, these types of tests for the club during the regular season. Considering I picked the Cubs over the Red Sox this year, this is one three game set I am very much in particular interested in seeing play out. Hopefully, it does so in the Cubs favor. What happened in 1918 has no bearing on what will happen this weekend. It was merely a blip on the radar throughout the century-plus long title drought by the Cubs. However, if in fact something dirty did go down 93 years ago in that Series now being questioned by fans across the baseball landscape…then this series would be a great opportunity to redirect the focus where it needs to be and where it deserves to be. All eyes will be on Fenway Park this weekend. Fenway Park is no Wrigley Field. Let’s ship up to Boston and show those Red Sox that they in fact are no Chicago Cubs. Get ready Bah-ston. We’re looking to sweep. Go Cubs Go! One of my favorite Prose features is the Cubs fan interview series I do called “Prosecards from Cubs Nation”. It’s always fun to hear more about why different fans root for the Cubs and how they would react in hypothetical situations regarding their favorite baseball team. Whether it’s someone I meet at a game, or someone I meet on Twitter or some other social media site…it’s always fun to have a chance to learn more about a fellow Cubs fan. Today’s Prosecard is with Christin Haws, otherwise known as @kikiwrites on Twitter. Check out what she has to say about loving the Cubs and the fight they are showing this season. If you want to be interviewed for a feature Prosecard, simply email me at proseandivy@cubsmvp.com and I’ll send you some questions! And now…Cubs fan extraordinaire, Christin Haws! Name: Christin Haws, KikiWrites if you’re on Twitter. PROSE AND IVY: Why are the Cubs your favorite baseball team? CHRISTIN HAWS: It’s because of my mother. She shook off her Cardinal fan upbringing and switched sides in a fit of rebellion and chose to raise her children in Cubbie blue. Actually, it was less deliberate than that. Mom watched/listened to Cubs games (she was brought up in a Cardinals household, but was never much of a fan) and I watched/listened with her. And so, at that impressionable young age, the seeds of love were planted. 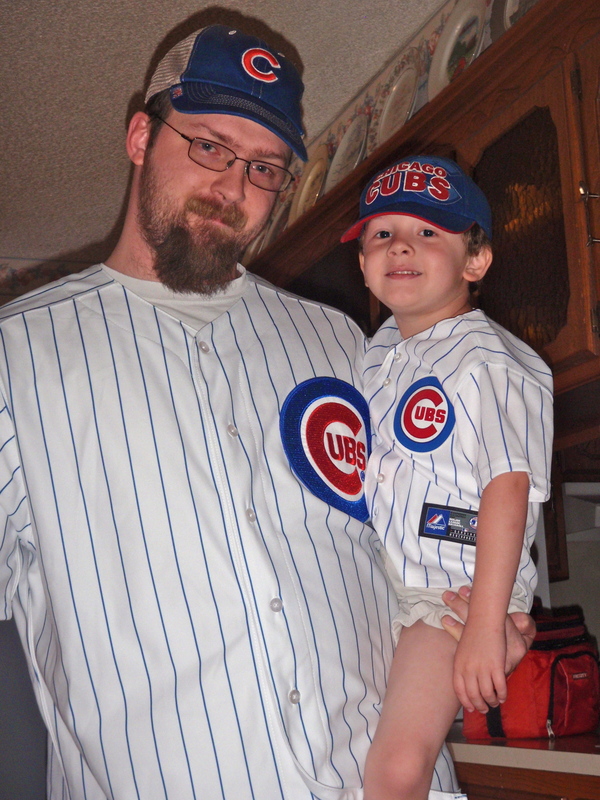 Now, twenty-some years later, I can’t imagine NOT rooting for the Cubs. They’re my home base. P&I: Who is your favorite Cub of all-time? CH: I hate the “favorite” questions because I’m always changing my mind, but in this case I can say with a fair amount of certainty that it’s Andre Dawson. I think the fact that we both played right field and wore number 8 at the same time during my youth sealed the deal. However, Doug Dascenzo will always be my favorite position player pitcher. CH: Ryan Dempster now that Ted Lilly is gone. Not that I mean to have Demp play second fiddle to Teddy. I love Demp as a pitcher and a person. He makes no excuses when he does poorly and gives away all the credit when he does well. I like watching him pitch because when he has it, it’s awesome, and when he doesn’t have it, he’ll do whatever it takes to find it. Lilly had the upperhand in my favoritism when he was on the team because he’s left-handed. I’m curiously biased like that. P&I: What is your favorite thing about Wrigley Field and what would be the first thing you would change? CH: My favorite thing about Wrigley is the feeling I get when I first see the field. It’s the warm, fuzzy, excited rush of YAY CUBS! No other field can do it to me like that. Oh, baby. As for changes, aside from moving it closer to my house (that’s more my problem than Wrigley’s; six hour round trips make for long days) and upgrading the player facilities so they can be more comfortable and competitive, I’d like a designated section of the bleachers for the frat party. If you’re just there to drink, you sit there so you don’t bother the people who are there to watch the game. And any home run hit into that section is immediately recovered and given to a fan who knows the inning, score, and/or name of the opposing team. P&I: What former Cub deserves a statue on Wrigley the most out of all the Cubs that either don’t have one or don’t have one planned already? Why? CH: Unless there’s something in the works that I haven’t heard about, I say Fergie Jenkins. Ernie Banks and Billy Williams have theirs and Ron Santo is getting his, all rightfully so, but I include Fergie in that group of guys. I’d like the complete set. P&I: If someone asked you ‘what is it like to be a Cubs fan?’ what would your reply be? CH: I’d tell them that it’s just like being a fan of any other team except that the insult bullseye on your back is bigger, the World Series drought jokes are staler, and the fan base is so polarized between delusional optimists and suicidal pessimists that you sometimes feel like there’s no happy medium. Other than that, it’s totally typical. P&I: The Cardinals call and ask for a trade of Starlin Castro, Tyler Colvin, Carlos Pena and Carlos Marmol for Albert Pujols. Do you make the deal? Why or why not? CH: No deal. Pujols is a fantastic player, of this there is no doubt. But I’ve always been big on TEAMS, not just one star guy. I’d rather take my chances with the four than pin all of my hopes on one. P&I: Which Cubs player would you most like to join Twitter so you could hear their random thoughts on a 24 hour basis? CH: Koyie Hill. Last season the guy said he had one more home run than a dead man. Clearly, he needs to be sharing thoughts like this on a regular basis. P&I: Ronnie Woo-Woo approaches you and reveals his biggest secret. He can make a World Series championship happen for the Cubs (he knows a guy) but in order for him to do so, the Cubs would have to give up Wrigley Field the season prior. The WS championship would happen in the first year of the new stadium. Deal, or no deal? CH: No deal. First of all, the romantic in me wants the World Series won in Wrigley. Second of all, I’m not selling my soul (or any part of me) to Ronnie Woo-Woo. Lastly, it’s Ronnie Woo-Woo. There’s no guarantee I’d hang around long enough to hear his whole spiel. P&I: How do you plan on celebrating the Cubs next World Series title? CH: Ideally, I’d celebrate in Chicago, living it up and partying down with my fellow Cubs fans. It’s been a long time coming. That party promises to be epic. I’d take my mom so we could celebrate, at least a little bit, together. She is the reason I’m a Cubs fan, after all. Realistically, however, I’ll probably have to work the next day, so whatever celebrating I could manage would be delayed until my day off. Or I’d call in sick. For several days. P&I: What was your first impression when they announced the BP Crosstown Cup? P&I: What is your prediction for the 2011 Cubs? CH: I think because everyone has set the bar so low, they’re going to do better than anticipated. They’re going to have a good year. Maybe not a championship year, but it’ll be good. I think they’re going to end up being a fun team to watch. Not because they’ll win all the time (though I do hope they win a lot), but because they’re actually playing like a team. They’ve got fight this year. I love that. Lots of updating still left be done to the site now that MLBlogs has switched over to WordPress, but so far so good. Interested to hear what you guys think of the new look. Still importing videos and images that were on the site before that apparently are still held up in WordPress customs. When I first logged on after the switch it looked like Prose and Ivy had been sent through an Etch-a-Sketch. Now, it’s starting to come together but would love to hear your thoughts. One thing that will be posted to the site this week that I couldnt’ get up last week because of the construction is a bunch of fan Prosecards from Cubs Nation interviews I conducted a few weeks ago. I received some great answers from a number of fans and I look forward to sharing them with you here. A post regarding my recent trip to Wrigley will be up soon as well including photos. I already miss the old layout of my site, but I’m coming around to building the new look. One thing I’ll be changing soon I think is the author photo. I made it the same one I use on Twitter for continuity, but I have some nice shots from Wrigley that I think would up the Cubs feel a bit and suit the ‘gravatar’ needs quite nicely. Lots more Prose and Ivy Cubs coverage is on the way, starting today! Thanks for hanging in there while the site platform was under construction this past week…site has a new look, but I’ll be continuing to give you strong Cubs content as best I know how.